FSR Racing Products has been supplying high performance all aluminum radiators for many years. Pit Stop USA is The Online Motorsports Superstore! FSR Racing Products has been supplying high performance all aluminum radiators to the racing community for many years. Garry Bell is the owner and works in the design department. He has raced Sprint cars for 29 years. The racing knowledge is what makes our high performance radiators achieve unmatched quality with a very competitive price. FSR Racing Products is located in Memphis, Tennessee where racing is a weekly sport. FSR Racing Products staff go to the race tracks to achieve the knowledge when it comes to Modified racing as well as Late Models, and Midgets, and Street Stocks. All FSR Racing Products are made right here in the United States. 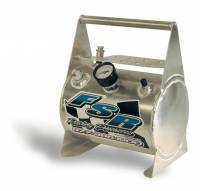 We feature FSR Racing Products Radiators, FSR Sprint Car Radiators, FSR Double Pass Chassis Mount Radiators, FSR Bleeder Check Tanks, FSR Engine Block Heaters and FSR Mobile Bleeder Tanks at low everyday prices.